An interview with music, video and conceptual design artist Sputniko! Born to British and Japanese parents, Sputniko! 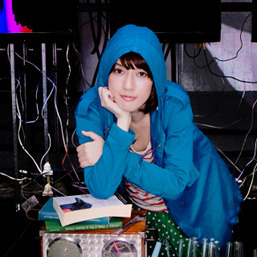 (Hiromi Ozaki) is a multi-media artist whose conceptual music videos went viral in 2010. 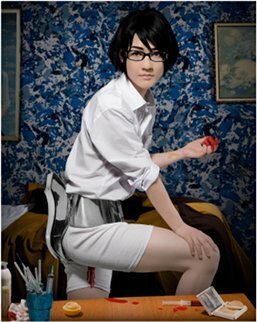 Her popular ‘Menstruation Machine’ project centered on a video, ‘Takashi’s Take’, and conceived of a future where menstruation has been eradicated and a man called Takashi (Sputniko!) deciding to build a machine that would replicate the experience of having periods. Her work has been featured in the “Tokyo Art Meeting: Transformation” exhibition at Museum of Contemporary Art, Tokyo (late 2010-2011), and the “Talk to Me” design exhibition at MOMA (July-November, 2011), and recent collaborations include with brands like iida, Louis Vuitton, Prada and more. Now you are being represented in the mainstream gallery world by SCAI The Bathhouse but you started off as a self-produced, self-promoted artist. How did all this come about? It’s only recently that I have a gallery and a music agency. All of the work I’ve made and put on YouTube is work I’ve made on my own, except for the ‘Crowbot Jenny’ one. I was at Imperial doing maths and computer science. And at Imperial College you have to take at least one Humanities subject before you graduate. I decided to take music because I like listening to music, and I was going to a lot of gigs and music festivals. And there was homework — we had to write five songs. I had never written songs before, never played instruments, but I just did my best. Because I listen to a lot of avant-garde music it was easier to write songs that were not good quality [musically] but were interesting. I graduated from Imperial College in 2006. At the graduation ceremony I was still twenty and I didn’t want to get a job straightaway. I decided to become a freelance programmer. At the time you were able to earn a lot. I could work just six months and then have six months free. I did that for two years and I thought I had to start building my career. Performing was a lot of fun but it didn’t seem like it was going anywhere. I thought I would go to the Royal College of Art. There was a course called Design Interactions that thinks about the relationship between culture, technology and people. I thought maybe I could fit in because I studied computer science and I wrote songs about technology. By the time I entered RCA I had already started making videos about Google and Skype. What I learned the most from the tutors at RCA was concept-building, and critical design and critical art. During the two years at RCA I really worked on how to make the fun stuff into something that is more conceptual. 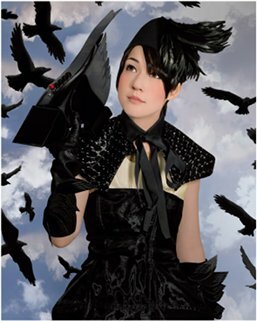 The ‘Menstruation Machine’, ‘Sushiborg Yukari’ and ‘Crowbot Jenny’ videos shown at MOT and MoMA were my graduation projects. That’s how it developed, from music homework. Everything really is from music. I sort of just ended up becoming a contemporary artist. How did your work go viral? How did it take off? I had my work online for two years before people started talking about it and it was completely ignored. Some people say I came out suddenly, I became popular suddenly. Actually, people were telling me how bad at PR I was! I didn’t do anything; I just put my work online. It was organic and took two years. When ‘Menstruation Machine’ came out there was the first spark from blogs. I showed my work at the RCA graduation show and there was a writer from Wired there. He saw my work and he put my work on Wired, and from there Boing Boing and all the tech blogs wrote about it. And then I did the MOT show in Tokyo just months after graduating. The curator, Yuko Hasegawa, invited me to the exhibition while I was still a student. The curator from MoMA came to see the RCA show and she also decided there. It was very lucky. The “projects” have a multiplicity that is very contemporary. They are both a video that exists digitally on the gallery of the internet, as well something conceptual (What if…? ), and physical installations in museums and galleries, and then also accompanied by photographs (by Rai Royal). You are also a big user of Twitter and social media. Would you describe yourself as a digital native artist? When I was still a student I didn’t have enough money to hire staff, so I could go on Twitter and find people to help me. For ‘Menstruation Machine’ all the staff were gathered on Twitter. There were fifteen people on the day of the shoot. That was my only tool. Maybe if I were established I wouldn’t do it. Likewise, because I couldn’t show anywhere, I turned to YouTube as my gallery. I think I am [a digital native artist] because I’ve been online since I was ten. My parents were very tech-savvy. I had my first website when I was thirteen and I was always using the web. It was natural. Your mind starts to work in different ways. Recently my Crowbot wasn’t working properly so I wrote about it on Twitter. And I found someone to help me repair it. I started out online — I didn’t really do shows in physical space. The first show I did after graduating was the Museum of Contemporary Art, Tokyo, and my second show was MoMA. But it’s mostly because I already had my work online. Most people try to get opportunities through showing in physical space but for me everything was online. So my style of work developed to suit the online environment as well. The video is viral; it’s a music video, so easy to watch for three and a half minutes and get the concept. Sometimes it’s quite sensational so you tell friends about it. And the photograph — it’s an image suitable for blogs. There’s a central concept and story, but there’s all this media that comes out of it. Because I started online that’s why my work is like this. But that’s a problem my gallery now has with my work: How to show it? If you show the video and the physical work all together it sometimes looks too explanatory. And sometimes it doesn’t really work in the physical space at all. Is it sustainable to be an artist using platforms like YouTube for presenting work? YouTube are saying that artists can make money from the advertising. But I get a lot of view counts and it only pays for my obento! To me it’s a bit like in Victorian times where the capitalists made the factories and made children work for free. YouTube made these sites for creatives to work for free! It’s weird for me because I’m from that. I’m from it but I don’t think it’s a good thing! There has to be a way of making money in this kind of world but it’s difficult for creatives. Now I’m lucky and I have sponsors. A lot of Japanese pop art or art that uses “pop” or otaku subcultural tropes often lacks any clear sense of self-awareness. It often seems just to want to be taken at face value, a kind of self-indulgent mimesis of the infantile. Your work, though, clearly references “Japanese” motifs of the “kawaii” and cosplay, and yet is also very ironic and knowing. The playfulness is very Japanese but the critical elements are perhaps your British side coming out. You’re really right. I am half British and half Japanese, so there’s this British black humour or irony, but then there’s this Japanese playfulness too. I like this Japanese extreme pop, this extreme happiness, but I often feel that it lacks in cynicism. Without cynicism it looks boring; it’s a bit disgusting sometimes! So I think my work is just a product of being in two countries. I don’t think that my work is completely offbeat. But some people may say that my work is too poppy or commercial-looking. I think people in Japan are a bit more scared to push something that is new. Aside from your obvious interest in technology, there are constant themes of gender and women too, most notably in the ‘Menstruation Machine’. My mum is a maths professor at Sophia University so she’s very much a career woman. She was always advising me how to live as a girl who doesn’t just want to be a cute little housewife. And then I studied maths and computer science at Imperial and I noticed that there aren’t that many women studying science. Why aren’t women more involved in this? These guys watching anime are going to build the new society. So I started to write songs about technology and women, and how girls should look at technology more. I started to get really interested in menstruation because in England or Europe the difference between male and female in terms of salary is really getting less, especially for young people. Japan still has problems but in England it’s kind of becoming equal. But if there’s something that’s not equal then there’s the biology side. Women get menstruation every month, there is pain and blood. And when they get pregnant, for nine months their body is kind of invaded a little bit. All these things people accept because we are human but maybe you could change these things through technology. I was reading up about menstruation and I found that menstruation was something you could stop. Doctors knew how to stop menstruation in the Sixties when doctors developed the contraceptive pill. They knew there was a way of taking these pills every day and not getting menstruation. But they thought that women would be too worried to use the pill if there was no menstruation so on purpose they made women take the pill for three weeks, and then not for one week, so during this they get a fake period, withdrawal bleeding. And that’s fifty years ago and there’s space travel, internet, DNA engineering, all this new technology but women are still bleeding every single month. In 2007 in the U.S. they finally released this new pill called the Lybrel, and it’s the pill you take 365 days a year and you don’t get menstruation. So I thought menstruation was a really interesting way to talk about gender; what we accept as women, what we accept as men. And with technology — would we change it if we could? — and even if technology progresses, society might not adopt it. Takashi is kind of the opposite. He uses technology to get menstruation rather than a woman using technology to get rid of it. It’s kind of a flipsided way of talking about the issue. I dress up as a guy who wants to dress up as a girl. To learn more about Sputniko! and her work, visit her website.